The only literary work about punctuation I'm aware of is an odd early story by Anton Chekhov called "The Exclamation Mark." After getting into an argument with a colleague about punctuation, a school inspector named Yefim Perekladin asks his wife what an exclamation point is for. She tells him it signifies delight, indignation, joy and rage. He realizes that in 40 years of writing official reports, he has never had the need to express any of those emotions. As Perekladin obsesses about the mark, it becomes an apparition that haunts his waking life, mocking him as an unfeeling machine. In desperation, he signs his name in a visitors book and puts three exclamation points after it. All of a sudden, Chekhov writes, "He felt delight and indignation, he was joyful and seethed with rage." Yefim Perekladin, c'est moi! At least, I used to be one of those people who use the exclamation point as sparingly as possible. We'll grudgingly stick one in after an interjection or a sentence like "What a jerk!" but never to punch up an ordinary sentence in an essay or email. We say we're saving them for special occasions, but they never seem to arise. The written language provides us with a dozen or so punctuation marks to clarify our meaning, but only one that conveys our feelings about what we're saying. Yet the exclamation point gets no love at all. Apple computer forbids its distributors to use it in their ads. The British school curriculum penalizes students for using it. There's a blog called Excessive Exclamation!! dedicated to documenting its misuse. It wasn't always so disreputable. Herman Melville and Nathaniel Hawthorne used it freely. But by the late 19th century, it had become the staple of lurid novels and the sensational yellow press, whose printers called it a screamer, a shriek or a bang. Ever since then, self-respecting authors have regarded the wanton use of exclamation points as illiterate and slightly vulgar. F. Scott Fitzgerald said that it was like laughing at your own joke. The mark was banished to the literary margins. Manual typewriters didn't even give it a key of its own. You had to type a period, then backspace and then type an apostrophe, by which time any spontaneous excitement would have fizzled away. It lived most of its life on the pulp paper of Nancy Drew mysteries and Superman comics. Tom Wolfe and Roy Lichtenstein made it the emblem of pop culture kitsch: "POW!" "WHAMM!" "VAROOM!" To be sure, most people pay no attention to the qualms of editors and grammarians and have always used exclamation points freely in their letters and diaries. Nobody found that alarming until the marks began to surface in emails and texts. Critics suddenly discerned a plague, an exclamation point addiction that copy editors call "bangorrhea." The impression is understandable. Exclamation points have become so obligatory in email that it can sound brusque to merely write, "See you then." People scatter them with abandon in texts and tweets to convey friendliness, surprise or indignation. Others use them for pure emphasis -- they write their message in all caps and then hold the exclamation point key down to string them out like a row of air horns. Of course, the more the bangs pile up, the more numbing they become. But the moral panic is overdone. We're not talking about The New York Times, after all. Texts and tweets are just an extension of spoken language. We punctuate them to capture the way we talk, and we aren't always going to use our indoor voices. I think of the Seinfeld episode when Elaine and her boyfriend broke up after he took down a phone message that her friend Myra had a baby without putting an exclamation point at the end. Elaine: See right here? You wrote "Myra had the baby" but you didn't use an exclamation point. Elaine: It's nothing, forget it. I just found it curious. Elaine: Well, if one of your close friends had a baby and I left you a message I would use an exclamation point. Elaine: You don't think that someone having a baby warrants an exclamation point? Jake: Hey, look, I just jotted down the message. I didn't know that I was required to capture the mood of each call. Elaine: I just thought you'd be a little more excited about a friend of mine having a baby. Elaine: Well, you know, Jake, you should learn to use them! Like the way I'm talking right now, I would put exclamation points at the ends of all of these sentences! On this one! And on that one! Jake: Well you can put one on this one — I'm leaving! You could think of that exchange as a skirmish in an orthographic gender war. Exclamation points have always been seen as expressions of girlish gushiness, and Jake's aversion to them suggests a certain horror of emotional display. As it happens, the research shows that women do use them more than men in online communication, chiefly to signal friendliness. That might suggest that some people aren't using them enough. Yet writers and editors only pride themselves on expunging the marks, never on sticking them in. When it comes to exclamation points, the only virtue we recognize is self-restraint. Look at the lengths people go to to find workarounds to avoid them. Some suggest replacing them with more descriptive language — instead of saying "See you there!" with an exclamation point, you can write "I'm so looking forward to seeing you," at the expense of replacing one skinny character with a couple of dozen fat ones. Others suggest that rather than effusing over some bit of news, you can add an animated GIF of Shirley Temple clapping her hands and let her do it for you. Or you can separate your words with what I think of as power periods, as in "Best. Party. Ever." — each one a little puff of certitude. But at that point, avoiding an exclamation point becomes more of a fetish than using one. I dropped my reservations a while ago. Now I use the marks as abundantly as I did when I was 12. Like Chekhov's Perekladin, I didn't come to appreciate them 'till later in life. But I figure I may as well go out with a bang. This is FRESH AIR. Ask writers and editors what's the most annoying feature of online communication and they'll likely tell you it's the abuse of the exclamation point, but our linguist Geoff Nunberg says people have been complaining about over use of the exclamation since Victorian times. In Geoff's opinion, the mark gets a bad rap. GEOFF NUNBERG, BYLINE: The only literary work about punctuation I'm aware of is an odd early story by Chekhov called "The Exclamation Mark." After getting into an argument with a colleague about punctuation, a school inspector named Yefim Perekladin asks his wife what an exclamation point is for. She tells him it signifies delight, indignation, joy and rage. He realizes that in 40 years of writing official reports, he's never had the need to express any of those emotions. As he obsesses about the mark, it becomes an apparition that haunts his waking life, mocking him as an unfeeling machine. In desperation, he signs his name in a visitor's book and puts three exclamation points after it. All of a sudden, Chekhov writes, he felt the light in indignation. He was joyful and seethed with rage. Yefim Perekladin, c'est moi. At least, I used to be one of those people who used the exclamation point as sparingly as possible. We'll grudgingly stick one in after an interjection or a sentence like what a jerk but never to punch up an ordinary sentence in an essay or email. We say we're saving them for special occasions but they never seem to arise. The written language provides us with a dozen or so punctuation marks to clarify our meaning but only one that conveys our feelings about what we're saying, yet the exclamation point gets no love at all. Apple Computer forbids its distributors to put it in their ads. The British school curriculum penalizes students for using it. There's a blog called "Excessive Exclamation!!" that documents its misuse. It wasn't always so disreputable. Melville and Hawthorne used it freely. But by the late 19th century, it had become the staple of lurid novels and the sensational yellow press, whose printers called it a screamer, a shriek or a bang. Ever since then, self-respecting authors have regarded the wanton use of exclamation points as illiterate and slightly vulgar. F. Scott Fitzgerald said that it was like laughing at your own joke. The mark was banished to the literary margins. Manual typewriters didn't even give it a key of its own. You had to type a period, then backspace, then type an apostrophe, by which time any spontaneous excitement would have fizzled away. It lived most of its life on the pulp paper of Nancy Drew mysteries and "Superman" comics. Tom Wolfe and Roy Lichtenstein made it the emblem of pop culture kitsch - pow, wham, varoom. To be sure, most people pay no attention to the qualms of editors and grammarians. They've always used exclamation points freely in their letters and diaries. Nobody found that alarming until the marks began to surface in emails and texts. Critics suddenly discerned a plague, an exclamation point addiction that copy editors called bangorrhea (ph). The impression's understandable. Exclamation points have become so obligatory in email that it can sound brusque to merely write see you then, period. People scatter them with abandon in text and tweets to convey friendliness, surprise or indignation. Others use them for pure emphasis. They write their message in all caps, then hold down the exclamation point key to string them out to the end of the line like a row of air horns. Of course, the more the bangs pile up, the more numbing they become. But the moral panic may be overdone. We're not talking about The New York Times, after all. Text and tweets are just an extension of spoken language. We punctuate them to capture the way we talk, and we aren't always going to use our indoor voices. I think of the "Seinfeld" episode where Elaine and her boyfriend broke up after he took down a phone message that her friend Myra had had a baby without putting an exclamation point at the end. JULIA LOUIS-DREYFUS: (As Elaine Benes) Well, see right here? You wrote, Myra had the baby - but you didn't use an exclamation point. MARTY RACKHAM: (As Jake) So? LOUIS-DREYFUS: (As Elaine Benes) So it's - yeah, it's nothing. Forget it. Forget it. You know, I just found it curious. RACKHAM: (As Jake) What's so curious about it? LOUIS-DREYFUS: (As Elaine Benes) Well, I mean, if one of your close friends had a baby and I left you a message about it, I would use an exclamation point. RACKHAM: (As Jake) Well, maybe I don't use my exclamation points as haphazardly as you do. LOUIS-DREYFUS: (As Elaine Benes) You don't think that someone having a baby warrants an exclamation point? RACKHAM: (As Jake) Hey, look. I just jotted down the message. I didn't know that I was required to capture the mood of each caller. LOUIS-DREYFUS: (As Elaine Benes) I just thought that you'd be a little more excited about a friend of mine having a baby. RACKHAM: (As Jake) OK, I'm excited. I just don't happen to like exclamation points. LOUIS-DREYFUS: (As Elaine Benes) Well, you know, Jake you should learn to use them. Like the way I'm talking right now? I would put exclamation points at the ends of all these sentences - on this one and on that one. RACKHAM: (As Jake) Well, you can put one on this one - I'm leaving. LOUIS-DREYFUS: (As Elaine Benes, laughter). NUNBERG: You could think of that exchange as a skirmish in an orthographic gender war. 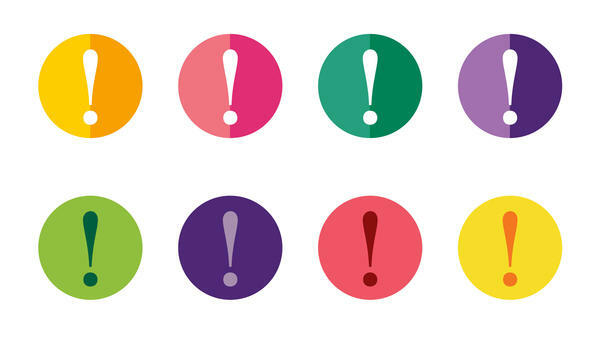 Exclamation points have always been seen as expressions of girlish gushiness, and Jake's aversion to them suggest a certain horror of emotional display. As it happens, the research shows that women do use them more than men in online communication, chiefly to signal friendliness. That might suggest that some people aren't using them enough, yet writers and editors only pride themselves on expunging the marks, never on sticking them in. When it comes to exclamation points, the only virtue we recognize is self-restraint. Look at the lengths people go to to find work-arounds to avoid them. Some suggest replacing them with more descriptive language. Instead of saying, see you there with an exclamation point, you can write, I'm so looking forward to seeing you, period - at the expense of replacing one skinny character with a couple of dozen fat ones. Others suggest that rather than a effusing over some bit of news, you can add an animated GIF of Shirley Temple clapping her hands and let her do it for you. Or you can separate your words with what I think of as power periods as in best - period - party - period - ever, each one a little puff of certitude. But at that point, avoiding an exclamation point becomes more of a fetish than using one. I dropped my reservations a while ago. Now, I use the marks as abundantly as I did when I was 12. Like Chekov's Perekladin, I didn't come to appreciate them till later in life, but I figure I might as well go out with a bang. TERRY GROSS, BYLINE: Please welcome Seth Meyers. DAVIES: ...We broadcast Terry's onstage interview with Seth Meyers, host of "Late Night With Seth Meyers," former head writer for "Saturday Night Live" and host of their news parody Weekend Update. His interview is part of our 30th anniversary celebration. I hope you can join us. And this note - in the introduction to our interview yesterday with Mark Bowden about the Battle of Hue in the Vietnam War, we played the clip from 1968 of a battlefield interview which took place during the fourth day of that 26-day battle, but we misidentified the CBS correspondent who filed that report. That correspondent was John Laurence. (SOUNDBITE OF JESSICA WILLIAMS' "I MEAN YOU") Transcript provided by NPR, Copyright NPR.